IAG launches new Austrian airline in three weeks! To give Willie Walsh and the rest of the IAG management team some credit, they don’t mess around when they want to get something done. IAG, the parent company of British Airways, announced yesterday that it is launching a new airline based in Austria. In three weeks time. The new airline will NOT use the Vueling branding, which is interesting. I wonder if the huge service issues that Vueling has had in the last couple of years – primarily when Alex Cruz was running it ….. – mean that IAG feels that the brand is ‘tainted’? 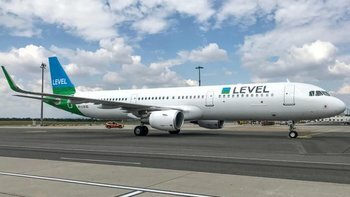 The new airline will be called LEVEL. This is, as most of you will know, the name of the start-up low-cost long-haul airline owned by IAG. This currently operates out of Barcelona with Paris due to start imminently. Why is IAG doing this? You may remember that IAG was keen to buy Austrian carrier NIKI from the ashes of airberlin. That deal fell through and Niki Lauda ended up buying back the carrier with financial support from Ryanair. As it happens, Vueling actually had an Austrian operating certificate issued in the name of Anisec Lufthart. This enabled it to launch LEVEL in Austria very quickly. Legally, the low-cost LEVEL flights will be part of Vueling. LEVEL will fly to fourteen destinations from Vienna. It will initially use four A321 aircraft, in an all-economy 210 seat layout. The first one, ironically, is an ex-airberlin / NIKI plane! The first two, launching on 17th July, will be Palma Majorca and London Gatwick. Over the following four weeks, LEVEL will add Barcelona, Malaga, Venice, Olbia, Ibiza, Paris Charles de Gaulle, Milan Malpensa, Dubrovnik, Larnaca, Alicante, Valencia and Bilbao. Lead-in prices will include one item of hand baggage. Checked baggage and in-flight food and drink will be chargeable. Flights can be bought at flylevel.com. If you are looking for a cheap trip to Vienna this Summer and can get to Gatwick, you might get a good deal here. I’m intrigued to see how this works out, and even more intrigued as to how the separation between Vueling and LEVEL will work. It is only for legal reasons it goes via Vueling. You should look at the intention rather than the legal implementation. Think the intention is to put the boot into Ryanair, which effectively controls Lauda. This is part of the – sometimes amusing, sometimes not – competition between Michael O’Leary and Willie Walsh, which started in Dublin decades ago. https://www.youtube.com/watch?v=vMH7bwdBbak is worth a couple of minutes of your time (especially if you want to know the official pronunciations for Vueling and Iberia). We’ll, that’s exactly it, I’m looking beyond the legal implementation: if I’ve read you correctly, the “new” airline (operating certificate granted to one Anisec Luftfahrt) will be called Level… which already exists under the IAG umbrella. That’s why I say this looks, sounds and feels like Level opening new routes out of Austria (despite all the underlying intricacies), and not really the launch of a new airline. I’m still having issues with the avios transfer from Lloyds to Avios acc. It is now being completed by a manual monthly transfer by the CS rep at Lloyds and I’d imagine that this will continue when the switch to BAEC occurs. But they have offered a measly £25 comp, belt tightening I assume. Also, I have an upgrade voucher with an expiry date approaching soon, can this be used one way back to the UK and what sweet spots are there apart from Hong Kong? Thinking UAE. Only Hong Kong and Brazil ban fuel surcharges. Oh well, I’ve a HKG trip booked anyway and taking in Vietnam so I was interested in the IC talk yesterday. Looks like I’ll loose the voucher. 10k Hilton garden inn in Hanoi (embassy district) is a particular sweet spot if you need a bargain. A cheap grab/uber car from anywhere. There’s a 10k Garden Inn in Vienna, too, which is useful here. It may work out well in the end – when my account was sorted out I got all 12,000 avios again and no less than 3 upgrade vouchers! I assume it’s because the computer system doesn’t recognise what’s been added manually and just gives you everything you’re entitled to while your avios aren’t posting. That’s interesting, I’ve had manual transfers for a while and transferred them all to BAEC. I wish there was a way to ‘cash in’ a voucher as I won’t use it. What will the airline code for these flights be? The same as the current one, IB? When so little is included in IAG premium brands economy fares (with no change in strategy in sight), what distinguishes Level and Vueling from BA or Iberia? Massive thanks to HfP for highlighting this. I just booked my family of four for a long weekend break during the summer holidays for 160 euros. I can’t imagine these fares will last long once they can be found on Skyscanner. Totally off topic – got an amex email about early access hamilton tickets. Sold out 40 mins after email arrived. But I did notice that there are currently about 20 tickets available for Tuesday July 3rd. £200 each, but still. Hamilton tickets have ALWAYS been easy to get in London. Because they are impossible to transfer (photo ID of the purchaser must be shown at the theatre, plus the credit card shown, 100% enforced) anyone who bought months ago and now cannot attend has no choice but to sell them back to the theatre, who promise to buy them. As long as you are on the site at the right time you get them. We went a couple of months ago, booked 2 weeks in advance. Yes, just keep checking the website for returns regularly and you’ll get in eventually – and for a lot less than the premium £200 tickets. Do you think the plat concierge will look out for the return tickets on my behalf? O/T Groupon Ireland Avios arrived in my account (redeemed yesterday) and very easy and instant transfer from Aer Club avios.com account to BA. O/T Just a quick query. I have priced up a cheap flight from AMS to BKK with BA in October. I know that the flight must be boarded at origin rather than Heathrow but on the way back the flight arrives at LHR at 18:20 and the connection is next day from LGW at 07:45. What are the implications if I just skip the last leg? Yes, they will. IAG is just a holding company, it does not have an AOC. What was announced last year was that the plan was for Level to ultimately be a “proper” airline with an AOC of its own (rather than a virtual one piggybacking on other group airlines’ AOC as it is now). Until this happens, the information in the article is correct. Smart move! Expecting nothing less from Willie Walsh. They will have had plenty of time to study the Niki books (incidentally the one part of Air Berlin that was consistently profitable). And they’re showing the 2 fingers at Ryanair: this will be operational a full 3 months before Laudamotion is able to launch. Wondering how many ex-Niki staff they have managed to poach. It was widely reported in the Austrian media that most of them were not overjoyed by the prospect of working for Niki Lauda. Would be interested in how this is related to hedging against brexit. Such an important topic that should be quite hard to avoid – and that I read absolutely nothing about on here. the link does not work. An error message appears when the Level site attempts to transfer to the Vueling site.